What is Aperture Academy About? First we'll tell you what we are NOT about... we aren't going to lead you on a cookie cutter, photography-in-a-can style photo tour where the instructor is off taking his own pictures while students are left to their own luck hoping they can capture a good image. Our instructors don't focus on their own photography during class, nor are they just spending some vacation days away from day jobs...this is the real deal, it's in our DNA, it's how we live and how we make a living. Who are we? We are a team of 15 people (and growing!) who work for Aperture Academy, LLC. A California company, founded in 2009 by master photographer Stephen W. Oachs, with a 4,000 square foot fine art gallery located in the heart of northern California. We have insurance (tons of it in this day and age), we work closely with the National Park Service to acquire all the necessary permits for access to the best locations, we pay our taxes... and our instructors are CPR and Leave No Trace (LNT) certified, in addition to being amazing photographers! Now, here is what we ARE all about... we are dedicated, enthusiastic, professional photography instructors that are devoted to your experience. We passionately teach people who are equally passionate about improving their photography skills, and are eager to take it to the next level. For beginning students, our personalized style of instruction is designed and proven to provide you with the skills and knowledge you need to create memorable photographs, not just "happy snaps." We work to be sure you take photos that you will claim proudly! For intermediate level students, you will expand your thinking and skill sets, so your photographs will reflect a fresh enthusiasm, life and perspective, resulting in images that you only imagined before. Your images will no longer be "pictures" of things, but will tell full, rich stories. For the advanced student, we will give you the support, supplementary skills and fresh perspectives to create a professional portfolio filled with images of people, nature, motion and objects that capture honest emotion, living moods and take conceptual ideas off the hook. In seeing to the needs of our student's skill levels, the Aperture Academy strives to offer the most diverse learning environments possible suited to all ages and physical abilities. Our field workshops can include easy strolls along the beach or park trail, to the more extreme, hiking high mountain trails and crossing rivers. 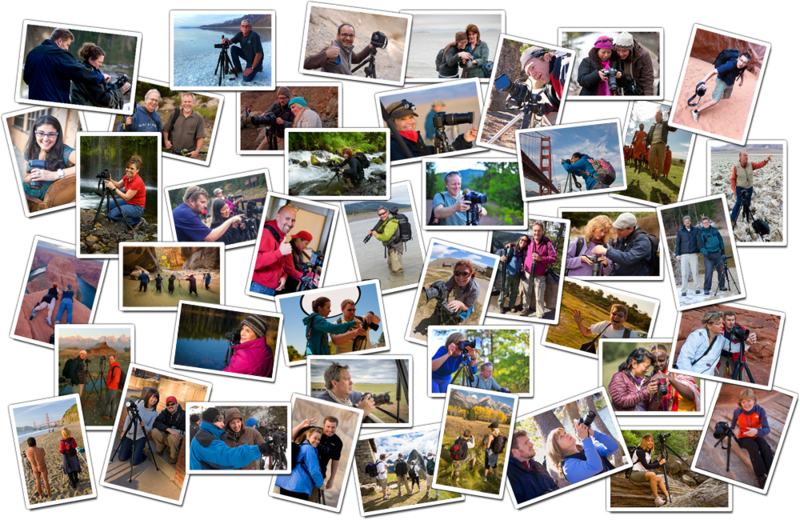 Our instructors are well acquainted with many of the most photographic locations throughout the western US including areas not normally traveled by the average tourist. Each year, the Aperture Academy conducts over 200 on-location photography workshops, Photoshop, Lightroom and printing classes for every skill level. Group sizes average between 8-12, and we always provide two or more instructors to ensure plenty of one-on-one teaching so every student gets the most out of their learning experience.